November 15, 1978 - To the nation in the 1970s, Pacific Foundation's WBAI is best known as the radio station that played comedian George Carlin's "Seven Dirty Words You Can't Say on Television" on its radio airwaves, and went to the U.S. Supreme Court to defend its right to do so, and (narrowly ) lost. 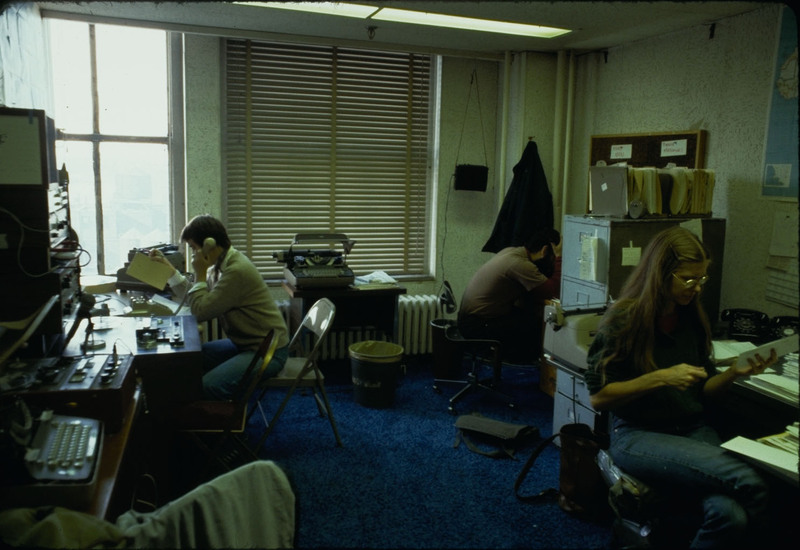 Hear how WBAI newscasts sound in 1978, plus an interview with WBAI News Director Celeste Wesson. But to New York, WBAI is a voice of non-commercial independence on a crowded commercial radio dial. And in contrast to most stations in New York who hammer our quick 5 minute newscasts, Pacifica Foundation's WBAI spends a full 30 minutes on its newscasts and focuses on a world of issues beyond gossip, crime, and stock political news. "A lot of people are accustomed, by growing up and listening to news feeds that are about the same length as commercials, and hit singles that are about twice as long as news feeds and commercials -- to listening to radio in very short segments," posits News Director Celeste Wesson at the WBAI studios on Manhattan's West Side. "Even if people listen in 10 or 15-minute segments, we're pushing it a little bit. I would imagine that when people listen to our newscasts, they listen to the first 15 minutes or the last 15 minutes or they leave the room a little. I don't assume that people glue themselves to the set the way that they would sit down in a movie theater and watch a movie." "It's not structured in the kind of rapid-fire way that a lot of other radio news is. On the other hand, I listen to the other radio stations [such as] the all news stations to get something quite different... to get the headlines... to get what 'just came off the wires.' Our newscast is less of a headline newscast and has more analysis, and there's no reason why somebody who likes one couldn't like both." "The point of having a longer newscast is to allow, once in a day, a thorough, comprehensive newscast to be broadcast," explains Wesson. "And I think people probably listen to our newscast somewhat more for the content than for the pacing of it. But I also do think there is a point to using a style that is not as bang-bang-bang ... headline-headline-headline. There's a point in trying to change the way people listen to radio. There's a different kind of two-way thing that can happen." "On the news there's not much of a two-way thing, but we encourage people to call with their ideas for news reports and in the rest of the station, there are a lot of call-in programs that aren't censored and elicit callers who can call in and talk for less than two and a half minutes. It's part of a way of thinking about doing radio that's different. I don't think the format is worth being concerned about; I think the format is a raison d'être of the newscast." 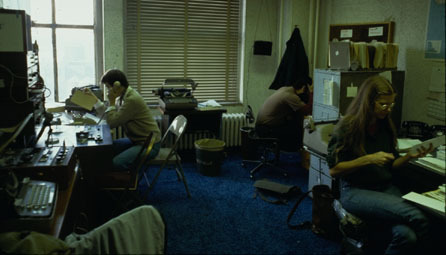 Functional & cozy... the WBAI newsroom. Celeste Wesson sits at right. WBAI tends to take an international view toward the news. "Sometimes I look at the front page of the New York Times the next day," says Wesson, "and it's pretty much the same: My lead was their lead; their off lead was my second lead... there's a similarity of news judgment. Other times it's different, partly because we do more international news and we would lead with something in Africa or Iran or the Middle East, and probably the other stations would lead with the Middle East and the other stories would be further in the newscast." "We almost never do police blotter stuff -- just extremely rarely and usually it would be because it did raise some kind of criminal justice issue. I really think that probably within a neighborhood, that's news. But to put a murder on simply because it's gory and violent is a ridiculous news judgment." Another troubling trend at other stations and papers: "I've been noticing lately ... a preoccupation with gossip as opposed to a preoccupatioin with police blotter stuff. I don't' know what kind of poll they've done to find out that sells more papers. " How does WBAI's non-commercial brand of news compare by what's offered by National Public Radio stations in 1978? "For one thing, a lot of NPR stations don't have a local news staff," explains Wesson. "They use [NPR's] All Things Considered and then they do local public affairs programing: interviews, panels, discussions, some produced features. But a lot of them don't generate their own news. We have a national news bureau which is basically supported by the five Pacifica stations and 15 other community stations who are subscribers. But they don't send an hour and a half of All Things Considered; they send down news reports and they also serve as an exchange for news pieces from elsewhere, which is something that All Things Considered tries to do with its affiliates but it's very uneven." "On the other hand, All Things Considered tends to be quite well produced. I think it's very listenable for something that's as long as it is. Sometimes I get completely frustrated with them because I think they could do so much more. And there's absolutely no reason to be sort of as superficial as they are -- they're very feature oriented. But other times I think they're probably doing an incredibly valuable service. To my friends in North Carolina and Vermont, ATC is the premier radio news. They really listen to it. They really rely on it. and I think All Things Considered is really valuable in that way." WBAI Datasheet - Station stats on staffing, wires, cart machines, and much more! WBAI Today - The official site of WBAI-FM New York. WBAI Alternative View - Run by the Coalition for a Democratic Pacifica New York.